The GIF is involved in a variety of research projects that utilize geospatial technologies. These projects include both GIF staff research and collaborative projects, as well as projects undertaken by the GIF user community that benefited from GIF training, advising, equipment or work space. 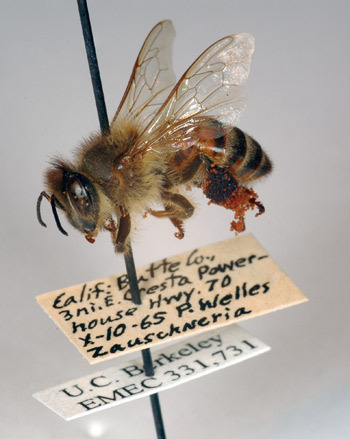 The Berkeley Ecoinformatics Engine, funded by the W. M. Keck Foundation, provides unprecedented integration and access to biodiversity information from the university’s rich and diverse repositories as well as tools to promote visualization and in depth analysis. This effort is a part of the Berkeley Initiative In Global Change Biology, and you can find a full description of the project at globalchange.berkeley.edu. In order to enable broad use of this information from a wide range of users, the GIF is developing an open API and online interface. Developers interested in building off of the API can learn more in the Developer's Guide. 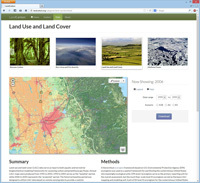 GIF staff are currently working with colleagues in the USGS to develop a web application to deliver and allow visualization of data from the LandCarbon program. The site will include access to a robust suite of data layers derived by the USGS project in a variety of spatial and tabular formats. There will also be map based visualization tool allowing users to quickly explore the data throughout the US. Cal-Adapt (http://cal-adapt.org) has been developed to showcase the wealth of innovative climate change research being produced by the scientific community in California, as documented in the 2009 California Climate Adaptation Strategy. Through a combination of locally relevant information, visualization tools, and access to primary data, Cal-Adapt allows users to investigate how the climate is projected to change in their area of interest, and gives them tools to plan for these changes. The site has been developed by the GIF with funding and advisory oversight by the California Energy Commission's Public Interest Energy Research (PIER) Program, and advisory support from Google.org. Learn more about the development of Cal-Adapt in a highlight article published in the June 2011 issue of PE&RS. The data used within the Cal-Adapt visualization tools have been gathered from California's scientific community, and represent the most current data available wherever possible. 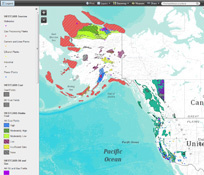 In collaboration with the California Institute for Energy and Environment (CIEE) and California Energy Comission (CEC), the GIF maintains the geospatial database and web mapping services for the West Coast Regional Carbon Sequestration Partnership (WESTCARB). The GIF developed and hosts the WESTCARB Carbon Atlas, an interactive geographical information system (GIS) showing the locations of major industrial CO2 emissions sources in the WESTCARB region, as well as areas with geologic formations suitable for storing CO2, boundaries of publicly owned lands relevant to geologic and terrestrial sequestration opportunity characterization, and features such as transportation arteries, rivers and streams, and jurisdictional boundaries. Sudden Oak Death (SOD) is a forest disease that has resulted in widespread dieback of several tree species in California and Oregon forests. 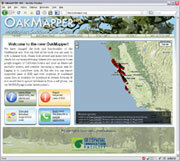 The GIF is working with the Kelly Research & Outreach Lab to host OakMapper, an interactive webGIS site where SOD sightings can be viewed and submitted by both research scientists and concerned community members. Please visit the site to find out more about SOD, and how you can help. GIF staff worked with scientists at the Lawrence Berkeley National Laboratory (LBNL) in researching the effects that future changes in California’s climate may have on the state’s energy infrastructure. In specific, LBNL’s researchers want to know how increasing temperatures, rising sea level, and a predicted increase in wildfire may effect our power plants and transmission lines. After identifying valuable environmental data sources from the Scripps California Climate Change Center (temperature), Pacific Institute (sea level), and the Westerling Climate Applications Lab (fire), the GIF has utilized GIS to link these layers with locational power plant and transmission line data, obtained from the California Energy Commission, within a spatial framework. Sathaye, J., L. Dale, P. Larsen, G. Fitts, K. Koy, S. Lewis, and A. Pereira de Lucena. 2013. Estimating impacts of warming temperatures on California's electricity system. Global Environmental Change. In Press. 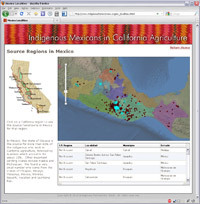 The GIF has developed a web map application for the Indigenous Farmworker Study, a partnership between farm labor researchers and the Indigenous Program of California Rural Legal Assistance (www.indigenousfarmworkers.org). UCB visiting scholar, Sandra Nichols and her research partner, Rick Mines, have put together a database that includes agricultural regions in California, and links to the source hometowns in Mexico where indigenous farmworkers have come from. The GIF helped to bring their data to life with an interactive map that highlights the selected hometowns in Mexico when selecting an area in California. Beneath the map, a table listing the localities is updated with each query. This interactive map was built on new ArcGIS Server technology that is improving our ability to create feature rich content with complex data sources. In addition to the mapping features, the website provides information on language, culture, and history of a group of people living and working in California for which little information is publicly available. A timely resource in advance of the upcoming national census efforts. Visit www.tahoeinvasiveweeds.org to see another GIF webGIS in action. 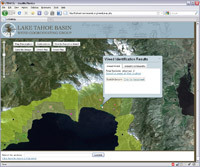 We have developed the site for the Lake Tahoe Basin Invasive Weed Coordinating Group (LTBWCG). Based on ArcGIS server technology, the site is designed to inform residents of the Lake Tahoe Basin about the invasive weeds species that can be found near their homes, and provides a platform for visitors to report new infestations to the group. 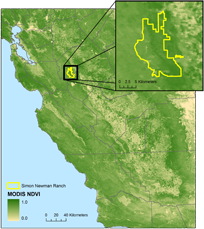 Miriam Tsalyuk, ESPM PhD Candidate, worked with the GIF on a project sponsored by the Nature Conservancy to evaluate correlations between spectral indices collected from MODIS satellite image data with residual dry matter (RDM) in a California Grassland. RDM is a standard used by land management agencies for assessing the level of grazing use on annual rangelands and associated savannas and woodlands. It is the old plant material left standing or on the ground at the beginning of a new growing season. RDM is the best method currently available to regularly measure rangeland status, and it requires regular measurements in the field. Miriam found that a significant enough correlation is present between the MODIS data and previous ground based data collections that future RDM analyses may benefit from this inexpensive (MODIS data is free to download) and timely method. Miriam conducted this research in the GIF in order to utilize both the GIS (ArcGIS) and Remote Sensing (ENVI & Erdas) applications that are available. She will used these tools to summarize and analyze the zonal statistics for different areas withi the Simon Newman Ranch, and now plans to expand the study to additional grasslands within the state. UCSF and UCB are worked together to provide a new approach to learning among health professional students. Established in September 2008, with funding from the National Institutes of Health/Fogarty International Center, the Global Health Framework Program focused on giving students an opportunity to work in multidisciplinary teams on global health projects abroad. The GIF trained the program’s students in geospatial techniques that could be used to analyze spatial questions in health. 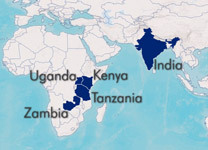 Using basic GIS, GPS, and remote sensing techniques, students learned how spatial analysis could be applied to develop a better understand of issues such as, access to health care facilities, and relationships between disease and environment. After gaining an understand of these methods, the students worked in five international clinics where they put their knowledge to the test. Bryan Voelker, a recent Master’s grduate in the College of Natural Resources’ Range Management program, mapped the Ventana Ranch in California’s San Benito County. He used several geospatial tools including GPS, GIS, and Remote Sensing to provide new data and analyses in a resource management plan for the ranch’s owner. Working with his advisor, Dr. Reginald Barrett, Bryan developed a plan that may both increase the potential for game and recreational hunting and improve the conservation status of the land. At 2,540 acres, the Ventana Ranch is a challenging area to map. Bryan used a professional grade Trimble GPS receiver to accurately map the property’s infrastructure such as roads, water sources, and fence lines, and areas of cultivation and brush clearing. Using a GIS, he overlaid these newly mapped features with existing data sets including soil type, slope, and aerial photos from the National Agriculture Imagery Program (NAIP) to create print maps of the area. Bryan’s project is a great example of how geospatial tools can help to inform landscape management and natural resource planning. The UC Berkeley campus is home to an amazing variety of ornamental trees. These trees are diverse in species, age, size, purpose of planting, and abundance. Utilizing GPS technology, Environmental Leadership Pathway’s intern Camice Revier spent her summer collecting point locations of these trees, including ancillary data (common name, dbh, condition, etc.) so that they could be represented in a GIS environment. Camice is attempting to create a living map of the UC Berkeley campus tree population, and her initial research has revealed that over 300 species are found here! She has compiled a detailed data dictionary, and has begun the time consuming process of collecting data in the field. An initial set of points along the western end of campus has been mapped, and methods are now in place to capture the entire area. Camice would like to expand this project in the near future to include a teen outreach component. 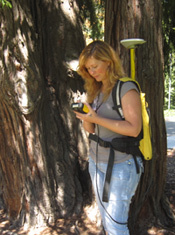 The students will have an opportunity to learn about GPS and GIS while gaining more exposure to UC Berkeley’s campus. She also would like to create a webGIS interface to share her findings with the Berkeley community.